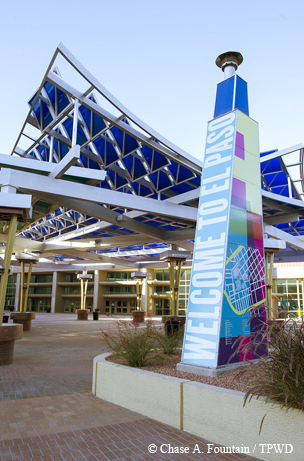 El Paso attractions preserve and illuminate the rich history of the area. For more than 10,000 years, prehistoric people, Spanish explorers, soldiers, Native Americans, settlers, stagecoach drivers and modern-day travelers have traversed the natural pass along the Rio Grande that slices through the Rocky Mountains’ southernmost extension to reach their destinations. On their way, many stopped at a special place. Standing on a rock shelter ledge at Hueco Tanks State Park and Historic Site under an impossibly cobalt blue, sunlit sky with ancient pictographs at my back and the sizzling Chihuahuan Desert sprawled before me, I realize that perhaps no place in Texas better represents humankind’s nomadic proclivity than this park amid the jumble of syenite boulders 30 miles east of El Paso. Here, on the edge of the great Southwest, history seems more palpable than any place in Texas I’ve ever been. 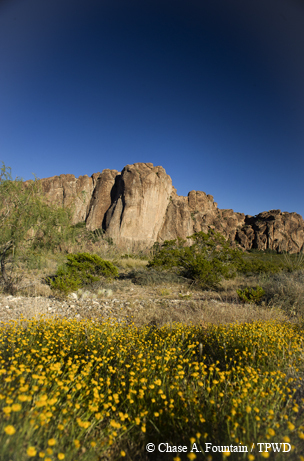 ﻿North Mountain rises above the desert at Hueco Tanks. Park maintenance ranger and native El Pasoan Jorge Marrufo guides my wife, Judy, and me to West Mountain, home to the Cave of the Masks. We ascend to a shallow cave decorated with dozens of discernible paintings — masks, a jaguar and human figures in ochre, yellow and black pigments — that Marrufo says interpret a kachina belief system. Hueco Tanks reigns as a world-class depository of more than 3,000 colorful pictographs (rock paintings) of faces, religious masks, dancing figures, geometric designs, animals and other symbols first left by ancient hunter-gatherers after the last Ice Age. In more recent centuries, travelers have been drawn to this desert oasis to take advantage of its shade, food, shelter and rainwater that pools in the pockmarked rock or huecos from which the park takes its name. Archeologists believe most of the pictographs are the handiwork of the Jornada Mogollon people, who built crude permanent dwellings at Hueco Tanks and raised corn from 600 to 1400 A.D.
To protect the ancient art and fragile resources from graffiti and other damage, the Texas Parks and Wildlife Department years ago tightened its access restrictions on many of the park’s more environmentally and culturally sensitive areas. Marrufo leads us to Site 17, a large cave known as Newspaper Rock that can be visited on guided, two-hour tours. He points out some “historical graffiti” from the 19th century, much of it lettering in charcoal and grease, inscribed by settlers, a Texas ranger, U.S. cavalry troops and others. It overlays pictographs left earlier by Apaches, such as a long, white snake. Hot, tired and thirsty, we head back toward El Paso to reach the historic Camino Real Hotel with just enough time to enjoy a refreshing dip in the rooftop pool before a late dinner. Having had enough of airplanes and cars, we decide to strike out on foot to one of a handful of nearby restaurants. I’m intrigued by the recent revitalization of the downtown warehouse district near the grand, old train depot. Union Plaza’s restaurants and clubs have become a magnet for El Paso’s burgeoning hipster scene and tourists eager to try something different in this Mexican food mecca. The next day, adventure calls to us in this unique border city. There’s no better way to absorb the size of the sprawling desert megalopolis of El Paso-Juárez (population 2 million-plus) split by the Rio Grande than to see it from the top of Ranger Peak in the Franklin Mountains. To get there, we drive 15 minutes to Wyler Aerial Tramway State Park and ascend to the mountaintop during a four-minute ride nestled inside a Swiss-made gondola. Judy marvels at the view of two nations (U.S. and Mexico), three states (Texas, New Mexico and Chihuahua) and 7,000 square miles. 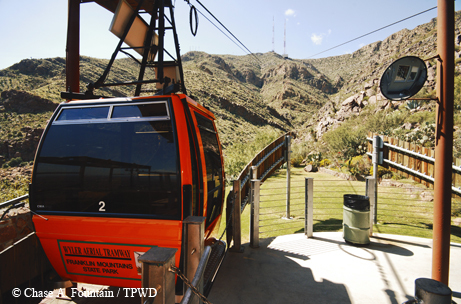 Wyler Aerial Tramway whisks visitors to the top of Ranger Peak. The tramway was originally built by El Paso television station KTSM to provide access to its broadcast tower for maintenance. Today, the TPWD-operated tram spirits 300 to 500 riders a day to the top of Ranger Peak, where they can visit a park store, enjoy interpretive panels explaining the landmarks below and access rugged trails that snake through the park. I’m curious about the new Jackalope Trail, and cautiously hike a short way along the mountain spine before declaring the trail more fit for goats than most humans. To reach our lunch spot on the other side of the mountains, I eschew Interstate 10 for the more scenic route. Scenic Drive, which winds along the mountainside, is dotted with several pocket parks overlooking downtown El Paso and Ciudad Juárez. Coin telescopes help bring the borderland into focus. After lunch, I drop Judy off at the hotel for an afternoon siesta, while I head to El Paso’s Upper Valley, one of the city’s more verdant areas, wedged between I-10 and the Rio Grande on the west side. I want to see how one of TPWD’s Far West Texas Wildlife Trail stops, Keystone Heritage Park’s El Paso Desert Botanical Gardens, is faring. I arrive too late, not realizing the gardens close at 1 p.m. Nearby, just off Doniphan Road, a Texas historical marker about the Doniphan Expedition reveals an important, but not well-known, part of American history. It tells of Col. Alexander William Doniphan’s military exploits in 1846 that led to the U.S. victory in the Mexican War. His troops’ victories in Mexico over the course of a year during a 5,000-mile expedition led to the annexation of more than 1 million square miles in much of what today is the western U.S.
On the way back to the Camino Real, I stop by the El Paso Museum of History to view compelling exhibits that tell the story of old El Paso from 1598 when Spanish explorer Don Juan de Oñate first explored El Paso del Norte. I admire a Ysleta Mission cedar door with hand-forged hinges and locking latch dating to the 1700s before browsing an informative display about the El Paso railroads, which in the 1800s fueled the city’s development and connected the east to the west and Texas to Mexico City. Another exhibit reveals the famous folks who once called El Paso home: newsman Sam Donaldson, actor Gilbert Roland, artist Tom Lea, bootmaker Tony Lama and U.S. Customs collector Pat Garrett (who would later kill Billy the Kid in New Mexico). I can’t visit El Paso without eating what I believe is the state’s best and most authentic Mexican food, served up home-style in such restaurants as Kiki’s. Judy and I decide on dinner at the treasured 100-year-old local haunt that has served as a restaurant since 1976. The spicy fare prominently featuring red chiles turned out by what our waiter proudly referred to as “the old Mexican ladies in the kitchen” does not disappoint. The Hispanic roots of El Paso, originally known as Magoffinsville, reach deepest in the string of 16th and 17th century communities that sprang up around the presidios and missions established by the Spanish along the Rio Grande southeast of the city in what is known today as the Lower Valley. San Elizario, which once sat south of the river channel, is the oldest community and the spot where Oñate and his small contingent of soldiers, friars and colonists arrived at the banks of the Rio Grande in 1598 after crossing northern Chihuahua’s brutal Samalayuca Desert. 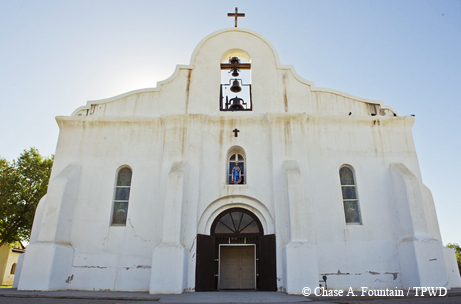 San Elizario Chapel anchors the historic town of San Elizario. Today, the charming town of San Elizario is enjoying a rebirth fueled by its state designation in 2013 as a State Cultural District and the tireless efforts of the San Elizario Genealogical and Historical Society. San Elizario hosts a monthly Art Market every third Sunday and occasional Art Walks and guided history tours. We stop at the visitors center to pick up a walking tour map denoting the various art galleries (including the Amado Peña Jr. Gallery) popping up in renovated historic haciendas and the dozens of landmark structures lining adjacent streets and clustered around the picturesque town square, over which looms the stunning 1882 San Elizario Chapel. A video about San Elizario, which was founded as a Spanish presidio in 1789, and informative Los Portales Museum exhibits prove invaluable background. One of the most popular tourist destinations is the Old County Jail, built in 1850 of adobe bricks and cottonwood logs, when San Elizario served as El Paso County’s first county seat in 1855-1866. The jail still contains the original steel cellblocks. Legend tells that famed outlaw William Bonney (Billy the Kid) broke into the jail to spring his cohort Melquiades Segura, the only man ever to escape the lockup. Jail museum curator and local artist Al Borrego regales us with a host of fascinating historical anecdotes about the history of the jail (which is located on the United States’ oldest main street), the town’s origin and San Elizario’s recent renaissance. After strolling the streets past adobe landmarks, we have just enough time to grab some crispy tacos and chicken enchiladas roja before heading to the airport. As we reach the boulevard leading to the airport, we salute the giant bronze of Oñate on his rearing steed — one final reminder of how El Paso’s rich past inexorably informs its present. Union Plaza's restaurants and clubs attract locals and visitors.